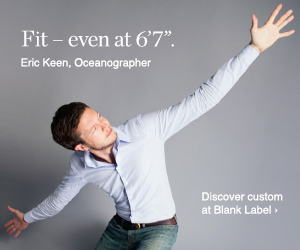 Ted Baker recently teamed up with 6'6" Mark Foster, one of the most successful British swimmers, to launch a US & UK range of tall clothing for men from 6'3" to 6'6" - offering extra long sizes at the point where most stores give up. On the web site, under Men's Clothes, go to "Shop By" in the grey bar and select "T for Tall" under Collections, or just search for tall in the search box. Ted Baker is a relatively new entrant to the world of men's fashion but has rapidly expanded across the globe from its humble roots as a shirt specialist in Glasgow. As one of the few brands to carry a dedicated tall range, they deserve a look! You will see stores in higher end malls around the country and maybe the easiest way to describe them is a quirky, colorful relation to J Crew. As they put it "Ted Baker appeals to style-conscious men who trust Ted to deliver that certain something...a little out of the ordinary. Ted offers the best of British style with a quirky twist". Ted Baker also has an extensive women's range but I am not sure whether that includes tall sizes. The range currently includes around two dozen items in multiple colors so there should be something there to appeal to most! These include suits in three colours, some shirts and a variety of pants. As Ted Baker's web site tells it, it was while travelling through French Polynesia that Ted was astonished to witness one of Britain's most successful all-time swimmers, Mark Foster, making waves in the sparkling cobalt blue waters off Bora-Bora. Listening to Foster's tall tales of squeezing into planes and trains (and, worse, having to settle for sartorial half measures), Ted rose to the challenge to create a swimmingly stylish and uncompromising range of clothing and footwear for all the tall people. Whether you believe that story or not, the T for Tall range is certainly a welcome addition to the limited clothing options for tall men.